Eric and Marilyn of "Fullshell"
We have met several other Baja Ha-Ha boats, but they seem to stay one or two days and move on. Early in the week we started exploring the town and found a great little restaurant where the locals go. They had Happy Hour from 2pm to 7pm with $1 tacos and $7 pitchers of beer. We met up with some of the other Alameda boats that stopped in Avalon on their way to Mexico. We had a great time and caught up on what everyone was doing. 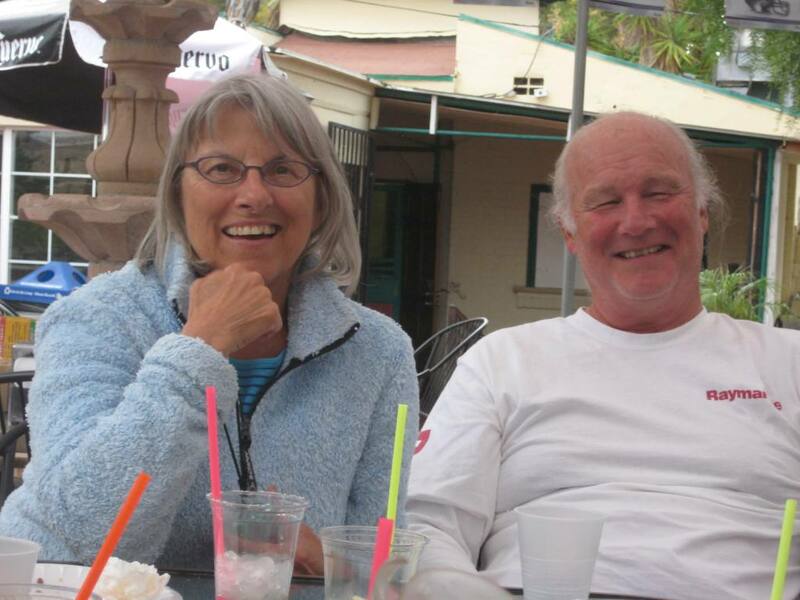 On Tuesday, Tom started the dinghy’s outboard motor from a weird angle and ended up tweaking his back, so he has been moving a little slower this week… It is hell getting old. The first three days of the week, a weather system moved through, causing a little rain and cooler days. Hey we’re cruisers and deal the hand we’re dealt. We decided that our boat needed a bath anyway and toughed it out. On Friday, the sun came back out giving us the motivation we needed to play tourist. We booked tickets on a “semi” submarine ride and a bus ride into the interior of the island. The submarine was actually a boat that looks like a submarine, with port holes that sit about six feet under the water. It drove through the marine sanctuary and we saw lots of underwater life. 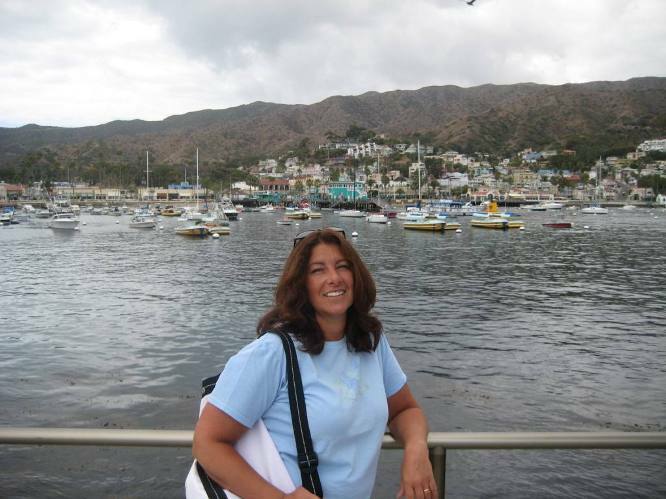 Later in the day we boarded a bus for a two hour tour, which made a round trip to the Catalina Airport. 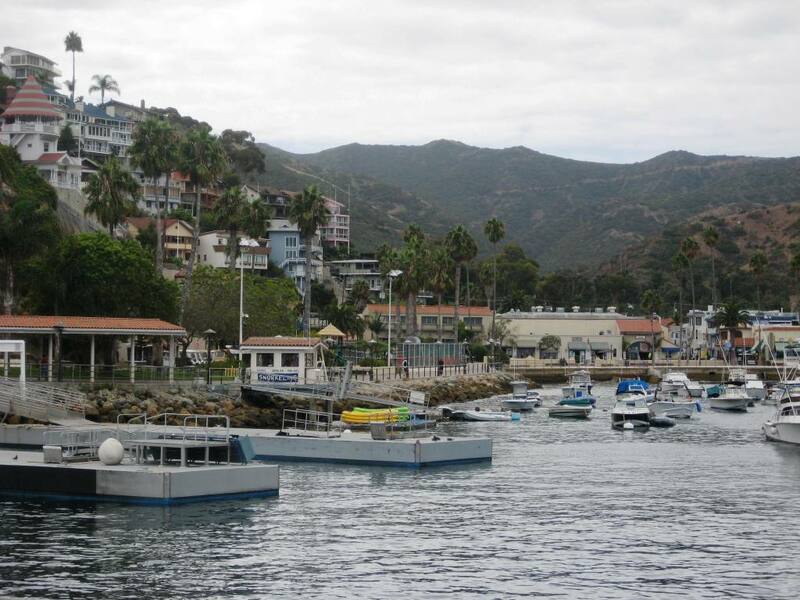 Catalina Island was once owned by the Wrigley Family (Chewing Gum & Chicago Cubs Owners). 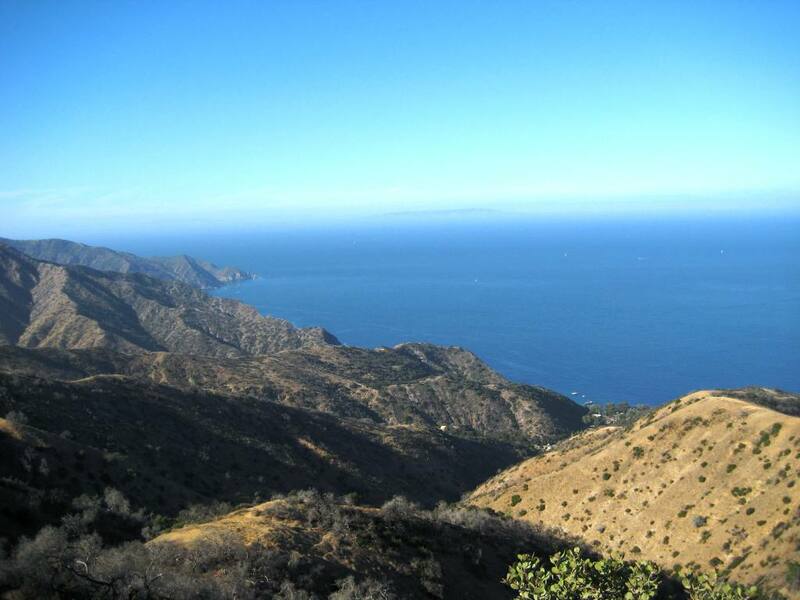 Later, they took 88% of the island and placed it into the Catalina Island Conservancy, which supervises the area and tries to keep it in its natural state. 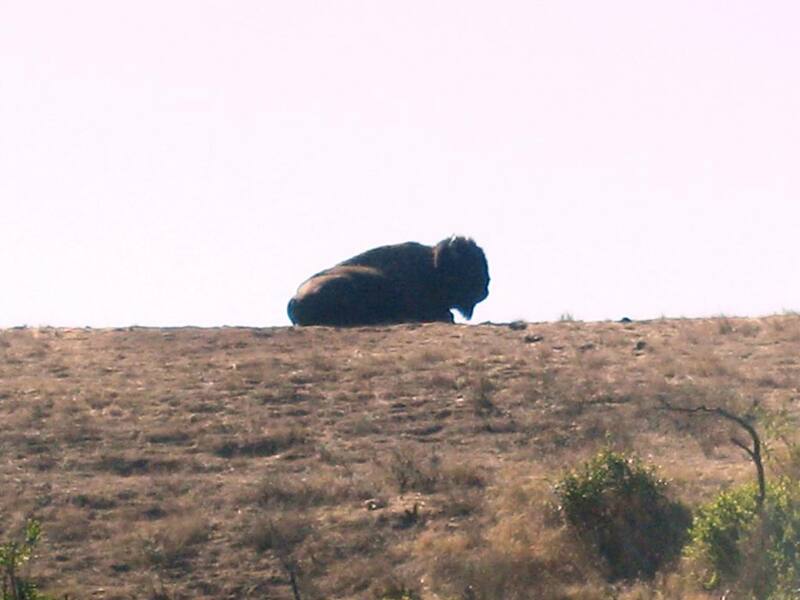 Along the way to the airport, we saw one of the island’s 120 buffalo lying in the sun. Buffalo on an island 26 miles from the mainland you ask? In 1920 or so they made a western movie on the island and brought 14 buffalos over for the film. According to the tour guide, instead of returning the buffalo to the mainland, the movie company left them here and over the years the heard grew to over 600. Recently, the Island Conservancy relocated much of the heard to various Indian reservations, which left 120 buffalo to roam free. When we arrived at the Catalina Airport, we discovered that it was pretty much a flat spot on top of a 2000 foot high mountain. The island residents rely on the airport for their daily mail and what doesn’t get shipped by barge comes in by cargo plane. As we strolled around the airport we saw the remnants of a plane crash that occurred a couple days before. 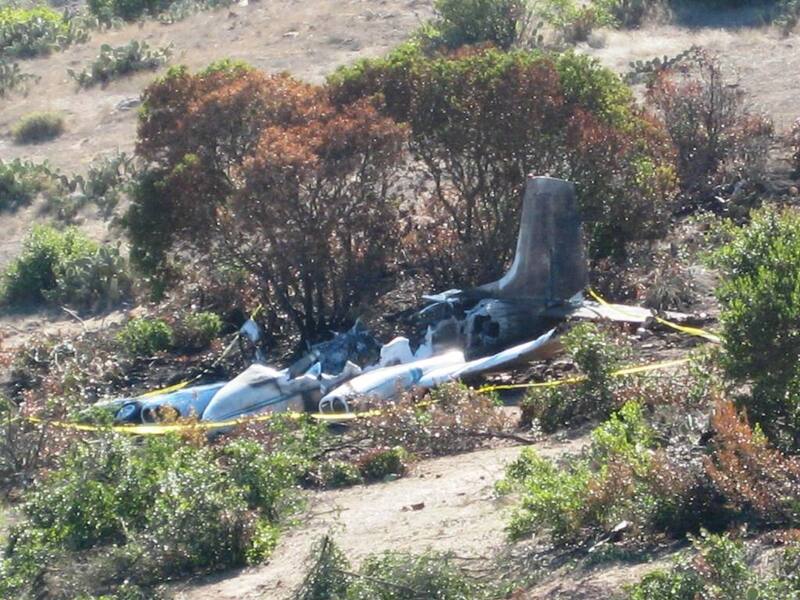 The plane remained with caution tape around it. Believe it or not everyone aboard lived. The bright side was the airport had a little restaurant with great chocolate chip cookies. After the short stop, we were back off to Avalon. Something I forgot to mention earlier was that much of this trip was on dirt road, which is the only real road between the City of Avalon and its Airport. So it takes 15 minutes to fly to Avalon Airport from Los Angeles, but then another 45 minutes to drive from the Airport to Avalon City. The Jazz Festival continues here and the Harbor is filled for the weekend. Each day we are serenaded by live music from the docks. Today, we did our grocery shopping at the local market. The big score was London Broil Steaks for half off. 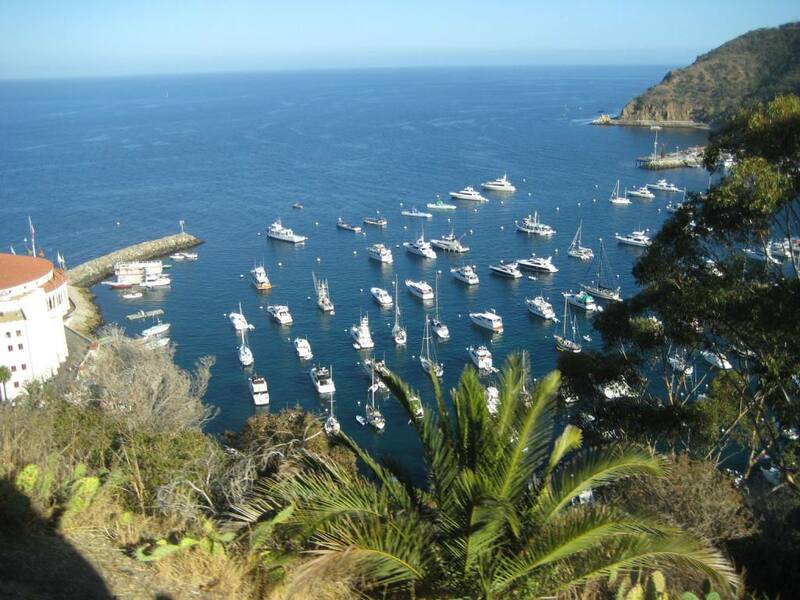 Sounds like you are enjoying Catalina Island. I liked it the several times that I have been there. Sorry that I haven’t been on the radio. I’ve been entertaining our guest from England pretty much full time since Sept 21. They will be leaving Tuesday evening, so hope to get back on the air sometime later in the week. Will try to give you an update on what has been happening at the Potomac. Looks like we’ll just miss you folks! We’ve been at Two Harbors (Isthmus Cove) since Friday. It’s fantastic hear, laid back and relaxing. Tuesday we are off to Oceanside. We had initially planned to head over to Avalon today for a few nights, but when our refrigerator died a bit over a week ago, those plans changed – new fridge getting shipped to Oceanside, and boat projects unfortunately trump awesome moorings! 🙂 See you further South! Sounds like you guys are having plenty of fun. I am glad that you got to get your boat cleaned and a nice hot weekend for land touring. Miss you two already. Did you guys try the waters again this last weekend?